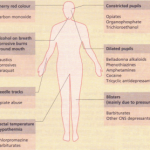 Adverse drug reactions can be classified in several ways. 1 Type A: the results of an exaggerated but otherwise normal pharmacological action of a drug 2 Type B: totally aberrant effects not expected from the known pharmacological actions of a drug. The mechanisms underlying many drug reactions, however, are unclear and these reactions cannot at present be classified easily, e.g. 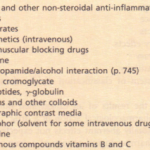 hepatotoxicity and analgesic nephropathy. 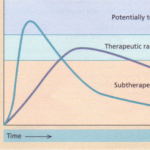 2 Reactions that appear to be unrelated to their therapeutic effects, e.g. the ototoxicity produced by streptomycin The first group, being predictable, can be anticipated and looked for without much difficulty. The second unpredictable group poses serious problems of recognition and quantification, particularly with a new drug. 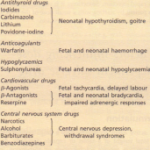 Factors that influence the dose at which these dosedependent effects appear. These occur in only a small proportion of patients and tend to be limited to certain well-defined manifestations. The possibility, however, of new syndromes occurring must never be overlooked. These reactions usually occur in patients who have previously been exposed and sensitized to the drug itself, to another drug of the same chemical class, or to one of another class of drugs that shares similar antigenic properties. For example, exposure to one form of penicillin usually produces a state of hypersensitivity to other penicillin derivatives, and, in a small proportion of patients, also to cephalosporin derivatives which share cross-antigenicity with the 6-amino-penicillanic acid nucleus. Most drugs are of relatively low molecular weight and only become antigenic when they are combined covalently and irreversibly with other substances of high molecular weight, usually proteins. The drug is then said to be a hapten. Sometimes it is a metabolite of the drug or an impurity produced during manufacture that acts as the hapten. The most common of these dose-independent reactions are acute hypersensitivity reactions. These are due to the release of histamine and other mediators following the interaction of antigen with antibody (IgE) produced by B lymphocytes and bound to the cell membranes of mast cells or circulating basophils. The released substances cause rashes, oedema and the more serious effects of bronchospasm, peripheral vasodilatation and cardiovascular collapse-the anaphylactic reaction. Circulating antigen-antibody complexes (immune complexes) cause the serum sickness syndrome. They are deposited for example in the basement membrane of the renal glomerulus. THROMBOCYTOPENIC PURPURA (e.g. with quinine) HAEMOLYTIC ANAEMIA (e.g. with methyldopa) DEPRESSION OF BONE MARROW FUNCTION, either selective (e.g. agranulocytosis) or total (aplastic anaemia). For example, chloramphenicol is a very effective antibiotic, but about one person in every 20000 develops a fatal aplastic anaemia that is unrelated to the dose administered and which cannot at present be predicted by any pre-dose screening test. The exact mechanism of this aplasia is unknown. 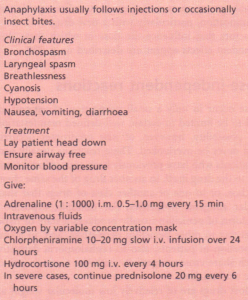 Comparison between dose-dependent, dose-independent and pseudoallergic reactions.